Cold and flu season means germs, and some places you go every day may be germier than others. "The prime source of germs -- and in the winter season, we're mostly talking about viruses like the flu and the common cold -- is other people," says Neil Schachter, MD, author of The Good Doctor's Guide to Colds and Flu. These five places are the germiest you're likely to visit, Schachter says. Public restrooms. Bacteria and viruses thrive in a moist place. So sinks, soap dispensers, and toilet seats can host germs. Your child's school or day care. In a school or day care, lots of kids are together. There will be lots of opportunities for germs to spread. Public transportation. "The closer you are packed together with other people, the more likely you are to spread germs to one another," Schachter says. So subways, buses, trains, and airplanes are likely spots to pick up germs. Your doctor's office. Some people in the waiting room may have a cold or the flu. Some pediatricians' offices have separate waiting rooms for "well" and "not so well" kids. But others don't, and you rarely see separate waiting rooms in doctors' offices for adults. Other public places. "Places like malls, food courts, museums, sporting events, and concerts -- anywhere big crowds of people gather -- are prime sources of germs, particularly if the space is limited and there are lots of people pushed together," Schachter says. Of course, you should still be out and about, living your life. You can take steps to keep germs at bay, wherever you go. Wash your hands often. Use soap and water. 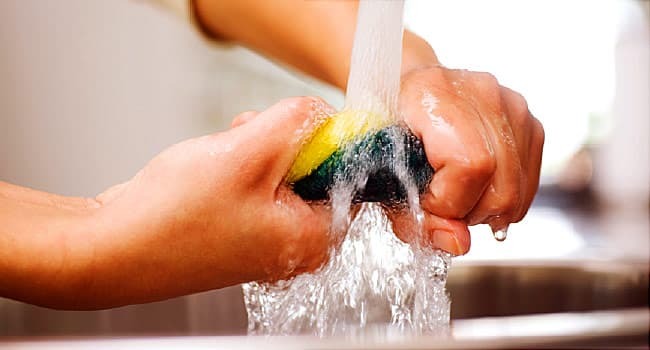 It can dislodge germs and send them down the drain. Carry hand sanitizer. It's handy if you can't wash your hands, especially if you're touching surfaces that other people use, like keyboards, elevator buttons, and door handles. Let something else do the touching. If you're in a germy place, like a doctor's office or your child's day care, press elevator buttons with your elbow, and use a paper towel to open bathroom doors and flush toilets. Only use banisters or escalator handrails if you need to for balance. Avoid touching your face, eyes, nose, mouth, and ears, so that germs on your hands don’t enter your body. Wipe down shared surfaces. Use your hand sanitizer or a package of sanitizing wipes to clean off spots such as food court tables (they're often just wiped down with a rag that only spreads germs around) or the desk or phones in shared office spaces. Leave the germs outside. When you come home, take off your shoes and wash your hands. That's a family rule for Bridget Boyd, MD, director of the newborn nursery at Chicago's Loyola University Health Center. "My husband and I are both in the health care field, and my son goes to day care, so who knows what's on our shoes?" she says. "But it makes sense for anyone. It's a good idea to wash off germs and dirt when you come home."